You never really quit Eve Online, you just take a break (maybe an extended one). In May 2018 Eve Online became XV. If you had an active Omega Account you got a set of „gifts“: apparel, skins and some ships. To give players something to do, CCP designed a special event called „Conscious Interruption“. 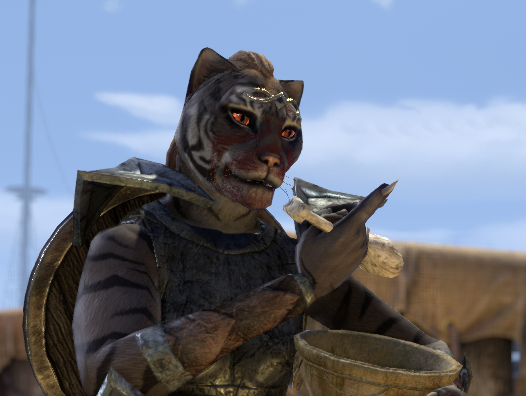 At April 1st 2014 I started playing Elder Scrolls Online and created a Khajiit dragon knight, because I wanted to play a non human race. Initially I did not play this char as a tank but as a dual wield damage dealer. Before the veteran zones were nerfed in July 2014, I had some problems surviving larger NPC groups. At that time the bash attack was quite strong, so I switch to 1 hand and shield skill line and heavy armor. As I had played a tank before in other games, I gave tanking in ESO a try.